As a home educating mom, Scholastic has been one of my best resources for affordable, quality educational resources. Scholastic has so much more to offer then just books (though I do love those too). In fact, Scholastic carries educational DVD’s, video games, board games and teacher’s resources in addition to the award winning books. In fact, Scholastic Storybook Treasures is also the #1 award winning children’s DVD series. My children and I recently watched one of their favorite picture book stories come to life on the Scholastic Storybook Treasures DVD featuring Tikki Tikki Tembo along with five other award winning stories such as The Tale of the Mandarin Ducks, The Stonecutter, Grandfather’s Journey, Lon PoPo: A Red Riding Hood Story from China and Sam and the Lucky Money. We had originally planned to watch only one story at a time but each tale was so thoroughly enjoyable that we ended up watching the entire DVD (approximately 66 minute running time). I really appreciated observing my five year old son attempt to read along with the story as the text appeared on the screen and he would get so excited when he was successful at reading a sentence on his own. Scholastic Storybook Treasures, produced by Weston Woods Studios promotes early reading, problem solving and friendship. In this edition, my children learned about the culture and people of China through captivating stories that celebrate Asian heritage and were interesting, engaging and entertaining. After we watched each story, I would go ahead and press pause on the DVD for a few minutes so we could discuss the storybook and my kids enjoyed answering questions as part of a fun quiz to see who could answer the most questions correctly. So not only did they enjoy watching these stories come to life but it also was a good supplement to their daily curriculum too. My children enjoyed all of the stories but the timeless tale of why “great long names are no longer chosen for their children (in China)” in Tikki Tikki Tembo was a favorite in addition to Lon Po Po which is the Asian version of the classic fairytale about Little Red Riding Hood. This was our first Storybook Treasures DVD that we have watched from Scholastic but it won’t be the last because I was so impressed with the quality and content. There are so many wonderful titles in the collection that my only problem will be selecting which ones to purchase first. With summer approaching, the Tikki Tikki Tembo Storybook Treasures DVD would be an excellent way to continue stimulating your young reader’s interest by bringing popular children’s storybooks to life. 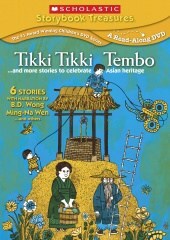 Tikki Tikki Tembo is being released on Scholastic Storybook Treasures on April 26 for only $14.95. You can purchase it or view any of the other award winning titles by visiting the website. I’d also like the Giggle Giggle Quack…and more stories by Doreen Cronin DVD! Her stories are wonderful and so funny! It would be nice to have the Where the Wild Things Are…and 5 More Stories by Maurice Sendak.